The Komodo National Park was founded in order to protect the resident giant lizards, the "Komodo dragons". Open grass-woodland savannah covers some 70% of the park. The last surviving population of the world's largest lizard, which is estimated at around 5,700 individuals, is distributed across the islands of Komodo (2,900), Rinca (900), Gili Motong (fewer than 100) and in certain coastal regions of western and northern Flores. The park includes the three larger islands Komodo, Rinca and Padar, as well as numerous smaller ones. The national park was founded in 1980. Later it was dedicated to protecting other species than the dragon as well, including marine species. The islands of the national park are of volcanic origin. Visiting in October 2018, the Komodo National Park was somewhat disappointing. The landscape is barren and sandy. Especially in October (end of dry season), most trees shed their leaves thus giving the impression of a dead or at least dying place. Here, I would definitely recommend other national parks in southeast Asia. The highlight of KNP is anyhow what you will find under water. For divers, Komodo offers a variety of amazing marine life, including manta rays, sharks, moray eels, and green turtles. I visited this WHS in August 2018. Instead of opting for a live-aboard boat trip from Lombok, also due to the several earthquakes and tsunami threats, we opted to fly to Lambuan Bajo, Flores instead and based ourself on a diving resort island close to different areas of interest within the Komodo NP for 4 nights. Not being much of a diver myself, I have to confess that the Komodo Dragons were the main reason why I visited and I had planned separate boat trips at different times of the day to Rinca Island and to Komodo Island. We were lucky to see plenty of Komodo Dragons on both islands even though the ones in Komodo were much more active when we visited in the late afternoon (top right photo). On both islands there are 3 types of guided tours (long, medium and short treks) and your assigned guide (armed only with a stick) will most probably do his utmost to convince you to opt for the latter two to avoid the scorching sun and to be as close as possible to the ranger station (where most likely you'll be able to spot deer and Komodo Dragons lazing about. I've read several reviews on the web saying that most probably these dragons are fed on some day/days every month by the rangers/guides which explains why some of them keep coming so close. This may or may not be true but I wouldn't go as far as saying that they are 'drugged' as once they're fed it can take them as long as a month to digest the food. Moreover, even the motionless ones were very well alert to what was going on around them and like crocodiles, one of their main predatory tricks is to lay motionless (even for hours!) and pounce on their prey when they get too close. In Rinca, our group opted for the medium trek to be able to also take in the panoramic sea views uphill. We saw male and female dragons, water buffaloes, deer, monkeys, kingfishers and herons. Most of the dragons here were not active. Females were guarding their eggs and males were lazing about. Only the juvenile dragons were moving along the water streams to drink. We were lucky to witness one male dragon attacking a zebra dove which happened to land to close to the dragon's mouth even though everything took place in a split of a second - too quick for photos or videos. In Komodo, I went alone with a guide on the long trek and apart from the heat, I was rewarded for my efforts. 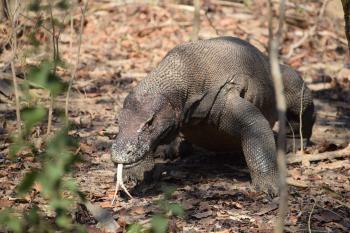 Not only did I spot more birdlife such as oreoles, brush-turkeys and birds of prey but also more active Komodo dragons further inland in their natural habitat, a long way from any built structure. I will never forget the close encounter with one of the bigger beasts which at a certain point got fed up of my zoom lens getting closer and closer and opened its mouth wide. The natural surroundings and wildlife alone already possess an OUV and are well worth visiting. But for me (as a non-diver), what really left me awestruck was the marine life and marine environment of Komodo NP in general. The best place to take in panoramic views of 3 different types of colourful beaches (black sand, pink sand and white sand) is from Padar Island (top left photo). The hues of blue in the sea are outstanding on a sunny day. Sunrise and sunsets are spectacular moments to be had every day with hundreds if not thousands of flying foxes/fruit bats coming in/out of the mangrove islands. 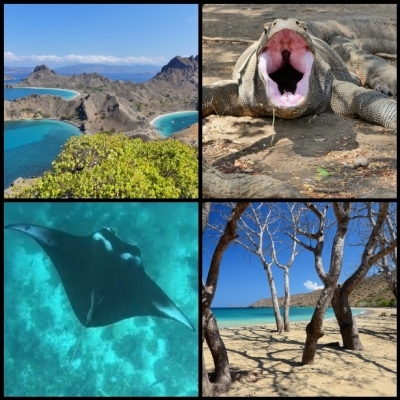 Komodo island has a very beautiful white sandy beach (bottom right photo) were it is not uncommon to spot different species of rays or sea turtles. Apart from the already splendid house reef around our diving resort with crystal clear waters in Sebayor Island, we visited several diving/snorkelling spots which were truly world class (if you're into diving/snorkelling - forget the picture perfect Maldives, French Polynesia, etc.). Not only were there endless varieties of healthy colourful coral, fish and marine life, but the water clarity was one of a kind. We visited Batu Balong (my favourite - literally it feels like an overpopulated aquarium! ), Batu Simsia, Batu Tiga, Lohkima, Pink Beach, Castle Rock, Gili Lawa, Tatawa, Turtle Point (with hundreds of sea turtles) and Manta Alley/Point with drift currents which direct you towards land accompanied by flocks of eagle rays and giant manta rays (bottom left photo). Truly a spectacular top WHS. Only negative point is the clumsy and confusing ticketing system for practically everything you do within the national park (from snorkelling to trekking). A practical solution would be to copy Raja Ampat's card system which was excellent and hassle-free. Rather than as a day trip from Labuanbajo, I visited Komodo National Park over the third and fourth days of a four-day boat trip from Lombok to Flores. 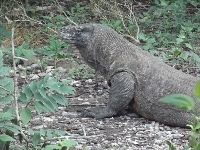 While I wholeheartedly recommend this experience for viewing the aquatic elements of the inscribed area, it is absolutely not the best way to see the Komodo dragons if that is your primary reason for visiting the national park. The tour stopped at a few standard beach-stops along the route within the National Park, along with up to eight other tourist boats. Some of these stops allowed for fine but not exceptional snorkeling, with patches of coral and a lot of fish, but others were stunning. 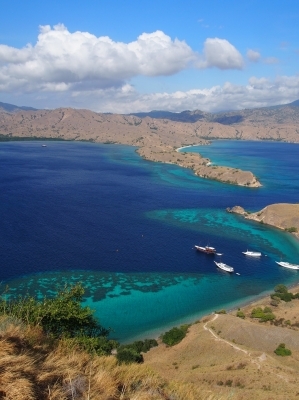 For me, Komodo National Park is a 5-star destination solely due to its manta ray population. The advertising material for the boat trip promised a designated 'Manta Point', which I cynically assumed probably wouldn't actually yield any mantas. I was overjoyed to be wrong, with three of the large, graceful creatures spotted immediately. Snorkelling above these weird fish in 6-10 metres of clear water was a magical experience. In stark contrast, the dragons were a pretty disappointing conclusion to the cruise. I am not sure if we received poor service from the park rangers due to us being a group of 30 backpackers, or if other groups departing from Flores get similar treatment. Maybe it was because we visited Komodo Island, rather than the more popular and accessible Rinca Island, as no other visitors were present. Upon arriving in the mid-afternoon, we were led to a lizard lying motionless outside one of the headquarter buildings. When it didn't react to our presence, the guide hit it repeatedly on the head with a stick until it walked away for our photo opportunities, which felt mean-spirited. After this, we walked to a 'waterhole' which held another stationary lizard, and then walked back the same way. The entire round trip was maybe 40 minutes, slightly different from the map at the headquarters offering a range of loop-walks from 1.5 to 3 hours that clearly we didn't get the option to follow. While I understand that the weather, and the fact that dragons only need to eat once a month, meant that they weren't active, the general mood on the boat leaving was one of conspiracy, with most people deciding that the rangers clearly drug the lizards to keep them docile at set readily-accessible locations. This is obviously rather implausible, but nonetheless indicates the general disappointment of the group. Stops at a white sandy beach and a pink coral sandy beach, with swimming and snorkeling is a great way of watching the marine wildlife. Along with the myriad of common fishes we spotted a crocodile fish! The currents around this area are strong and dangerous. Some divers end up in accidents resulting in injuries or even death, so a guide is mandatory both for divers and for island visitors. We had close encounters with the dragons both days, the first day at Rinca (it’s pronounced “rincha”) and on the second day on the biggest island in the park – Komodo. Both islands were somewhat alike, meaning you don’t really have to visit both islands. Rinca is closest, but a visit to the Komodo National Park is not complete without seeing some of the Komodo itself. The ugly beautiful dragons are really fascinating to watch. We first spotted them around the ranger station (where they were fed leftovers from the ranger stations kitchen) and in the wild and further into the lowland of the island. They seem slow and clumsy and not dangerous at all, but our ranger could tell us that they could speed and outrun humans, and with the venom in their mouth together with a number of sharp teeth, they are really dangerous - also to humans. There were plenty of dragons prey around, like small deer, water buffalo, wild boar and monkeys. Strangely “the victims” didn’t seem nervous or scared of the dragons nearby? We’ve only seen this type of animal behavior in Galapagos before. A natural site which includes animals is great, and when there are endangered species to watch as well it’s even more fantastic. After two days at sea we spent the night and morning at a hotel ten minutes by car from Labuan Bajo. This tranquil location with fantastic scenery next to the Flores sea is highly recommendable especially as a counterbalance to some of the really crowded hotels and beaches in Bali. I flew from Jakarta, where I spent the month of November 1997 on business, to Komodo Airport in Labuan Bajo on Flores. I had not made any prior arrangements, but was met at the airport by several fishermen and hired one to take me to Komodo Island, one of the three islands that form Komodo National Park. I stayed at the ranger station at Loh Liang, which has bungalows and a restaurant, and the rangers organized a hike to the Banugulung viewing area, an hour from Loh Liang. There were several komodo dragons at the Banugulung viewing area, but it was also easy to see dragons while walking around the grounds at Loh Liang. I travelled to the islands of Komodo and Rinca by boat from the port of Labuanbajo on Flores Island. 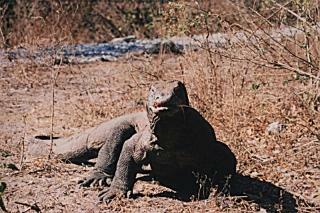 Before landing on Komodo I spotted three dragons marching along the beach towards the jetty. This was just the beginning of an interesting day on the island. After a briefing as to the fierceness of the dragons, I was escorted on a hike through the savannah-like landscape. Along the way found juvenile dragons living up trees, and fully grown ones on the ground. Also saw examples of the dragon's prey : deer, water buffalo and pigs. At Pink Beach on Komodo Island spent some time snokelling and admiring the colourful fish and corals that are part of this WHS. On Rinca Island it was another hike to see more of the dragons, both juvenile and adult as well as their prey. It was a revalation to learn how such benign looking creatures can become such lethal killing machines. My visit to Komodo National Park is one of the best experiences that I ever had. 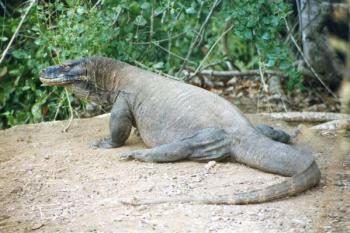 It is the only place in the world where we can find the giant lizard Komodo (Varanus Komodoensis) in their habitat. The adult size can be measured until 3 meters ! Actually The Park is also famous for its underwater scenery. Within less than 60 minutes traveling between one dive site to another, we can find different kind of fishes, different kind of panorama. Based in my experience, I do know now that it is very crucial to preserve our nature for our future generation. Whales: blue whale and sperm whale "are occasionally observed"